Messier 45, also known as the Pleiades or Seven Sisters, is a spectacular open cluster lying approximately 400 light years from Earth and consisting of up to 1000 stars. Surrounding its brighter stars is a dust cloud revealing itself as a beautiful blue reflection nebula, giving this object such great appeal among astro-imagers. Although the seven brightest stars of this asterism are naked eye objects under good sky conditions, the faint nebulosity surrounding them is only fully appreciated by photographic means. The brightest stars in the asterism are named for the Seven Sisters of Greek mythology and their parents, Pleione and Atlas. 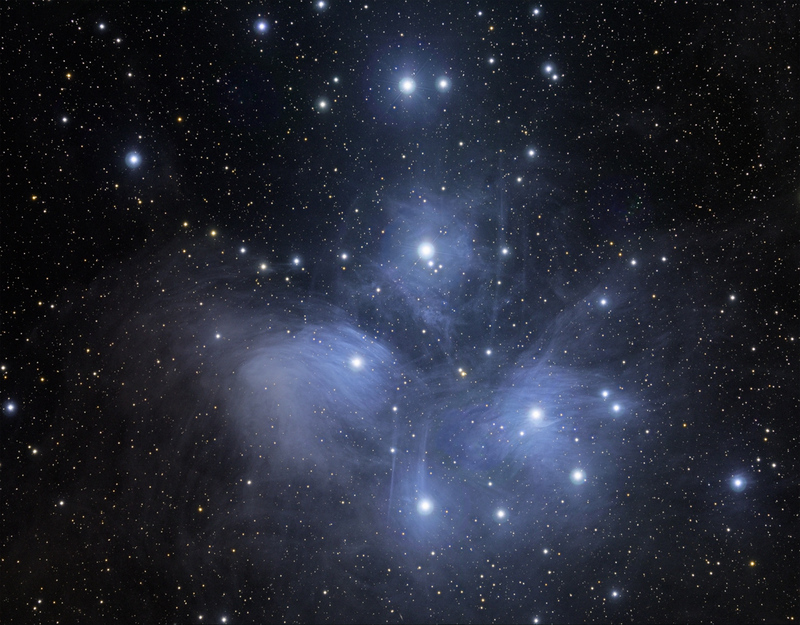 The names of the Seven Sisters are Alcyone, Merope, Electra, Maia, Caleano. Taygeta and Sterope. These young, hot blue stars are relative newcomers to the Milky Way, being forged in the gas and dust of interstellar space approximately 100 million years ago.